Our friends from Knockhill made the long trip south to attend this week’s Season Launch at Donington Park, and left the event even further fuelled ahead of its own BTCC round later this year. Not only is the Fife venue looking to build on one of its biggest ever BTCC crowds, which it attracted in 2013, but there’s also spectacular plans to celebrate Jim Clark’s 50th anniversary since he won Britain’s premier motor sport series. 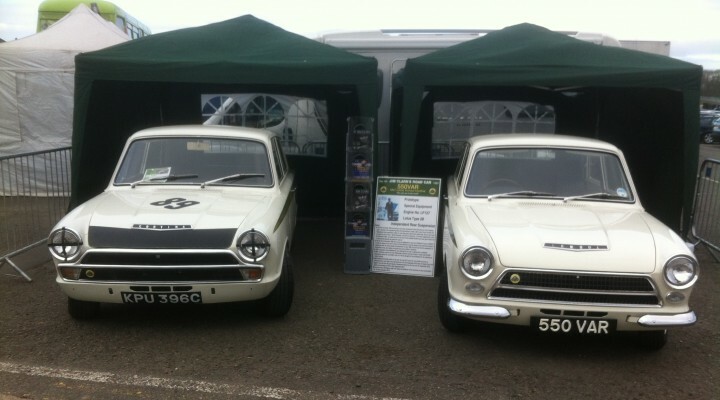 Clark’s famous Lotus Cortina from that wonderful 1964 season was present at Donington, alongside one of Jim’s road cars – a bespoke Cortina that had been developed by his then Team Lotus boss Colin Chapman. Fife born Clark is regarded as one of the greatest racing drivers of all time and his amazing achievements are to be marked on 21st August with a Forth Road Bridge crossing of a selection of his race cars and also at the Knockhill 40th Anniversary/Homecoming Scotland 2014 BTCC meeting on 24th August. The Jim Clark celebrations start on Thursday 21st August at 9am with a static display of his cars in the former Lorry Park at the Forth Road Bridge HQ in South Queensferry. Then at 11am the parade of cars will make its way across the Forth Road Bridge, from South to North. This historic sight, including a Grand Prix winning Lotus 32B, Lotus 43, Jim’s championship winning Lotus Cortina and his own road Lotus Cortina will be accompanied by some of the 2014 crop of BTCC machines. The same cars and a gathering of Cortinas will parade Knockhill at the BTCC event on the Sunday and there will be a marquee of exhibits from the 70’s, 80’s, 90’s and 00’s, marking the amazing four decades of Knockhill Racing Circuit, Scotland’s National Motor Sport Centre. 20% of all BTCC tickets sold using the code JIMCLARK50 will go towards the development of the Jim Clark Room, planned for 2018. Visit www.knockhill.com for more details.